The Volcano Classic and Volcano Digit now ships with the new Easy Valve system which combines the best of the older Solid Valve and Easy Valve systems. If you are looking for the older-style Solid Valve system it is still available as an add on - above. The Volcano vaporizer is the desktop vaporizer that every serious vapor enthusiast longs to own, as no other model on the market today can rival its performance. Volcano Classic is designed for optimal efficiency, so you can enjoy your dry herbs to the fullest, as it delivers potent vapor, free of impurities. Volcano Digit is the latest version of luxurious creation for any vape enthusiast, with updated temperature control system and a dynamic digital display. Considered by many to be the best desktop vaporizer in the world, the Classic version is a reliable, powerful vape that is crafted to stand the test of time. Storz and Bickel revolutionized the world of vaping with the release of this forced air vaporizer, and it's sure has changed the way to vape forever. But who says you can't improve upon a masterpiece? Storz & Bickel has done just that with the newer Digital model! With an updated temperature control system and a dynamic digital display, the Volcano Digit is the latest version of the world's most luxurious tabletop vape and is the perfect choice for any enthusiast who truly wants the best vaporizer and experience. 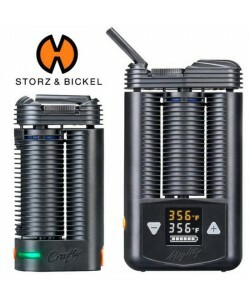 Storz and Bickel team is world renowned for their innovative designs, and their reputation for manufacturing impressive vapes began with the Volcano. This bulky desktop vaporizer sets the gold standard for herbal vapes by producing plentiful clouds of flavorful, smooth vapor without ever combusting your dry herbs. With it, vaping alone or with friends is incredibly easy. The forced air convection design is incredibly accurate and capable of remaining at your desired temperature throughout an entire session. A powerful air pump quickly fills vapor bags, while the easy valve system keeps vapor safely inside until you're ready to draw. Always manufactured in Germany, the Volcano Vaporizer is sleek and stylish. Every model is manufactured out of premium stainless steel that won't corrode or rust with age making it ultra efficient and capable of fully vaporizing all types of herbs, waxes or oils, and it is backed by a 3-year manufacturer's warranty by the brand. The Volcano Classic is designed for optimal efficiency, so that you can enjoy dry herbs to the fullest. With every use, it delivers plentiful vapor that is free of impurities and potent enough to satisfy even the most discriminating of vape enthusiasts. With the special designed fan system, vaping is incredibly easy. After you set the temperature using the analog rotary dial, the Classic vape goes to work, filling the vaporizer bag in just a minute. Once the bag is filled, you can draw at your leisure without worrying about mastering a special technique, stirring your dry herbs or holding onto a whip. This makes the Volcano models popular with beginners and experienced vapists alike. Every single part featured in the Volcano is of impeccable quality. The heating element is constructed out of ceramic for a contaminant-free clouds, yet it is encased in steel to protect it from damage. Cellulose insulation ensures that the aluminium housing of the unit remains safe and cool to the touch. A powerful diaphragm pump drives the system, and it is crafted in Germany in accordance with rigorous quality standards. The careful attention to quality and performance makes the Volcano Classic Vaporizer a masterpiece. Inside of the Volcano Digit is a highly sensitive heat sensor that monitors temperature levels and automatically adjusts the fan speed and heating element performance to maintain temperature within a 3-degree range, a level of accuracy that is virtually unheard of in the industry. The LED display makes it easy to set the ideal temperature of vaporization to the exact degree that you desire. The display shows both the current temperature and the set temperature, and you can quickly change from Celsius to Fahrenheit to suit your needs. Setting the temperature is as simple as pushing the arrows on either side of the display. The Volcano Digit Vaporizer also uses a top-of-the-line ceramic heating element, a diaphragm pump and an optimized forced airflow system to vaporize herbs efficiently and fully. Constructed out of nontoxic polyethylene, the vaporizer balloons become completely inflated very quickly, so you can begin drawing as soon as possible. Because it is well insulated with cellulose, the exterior of the Digit vape does not become uncomfortably hot. With the digital version, you're also guaranteed pure, potent vapor that tastes great with every draw. Both the Classic and the Digit Vaporizers will treat you to an incredible vaping experience. Both models are designed to outperform other desktop models on the market today, but there are some minor differences between the two similar designs. The Classic Volcano features an analog temperature setting dial that allows you to set the temperature between 266 and 446 degrees Fahrenheit with the twist of a knob. With the Volcano Digit, you get the convenience of an LCD digital display and precise controls that make it possible to set the vape for the exact temperature that you desire from 104 to 446 degrees Fahrenheit. In addition to giving you the freedom to specify the exact number of degrees for your vaping session, the it also shows the current actual temperature and has an automatic shut-off feature that powers down the vape after 30 minutes. This thing looks amazing! The very accurate temperature control system makes it well worth the price, I have full control over it. Surprisingly, I’ve been using the dry herb aromatherapy option as well – I needed something to cover the smell haha – and it works like a charm. Yeah, it’s one of the most expensive vapes, but I wouldn't want to live without it now. Finding the right temperature is so easy with this one, I’m super happy now that it’s mine. After giving it a few trial runs over at my neighbor’s place, I knew I had to have one myself. The clouds are unbelievable each time and you don’t get a headache finding the right settings. Vapes everything evenly - Review by Willie G.
I had the Herbalizer before I had the Volcano Vaporizer and I must admit that I like the volcano a lot more than I ever liked the Herbalizer. It is super easy to use whether I want to use it with a baloon, a whip or the aromatherapy function. I like how the chamber is the perfect size to where it does not ruin the herb while trying to vape it. Instead, it seems to vape everything pretty evenly. Super thick clouds - Review by Arthur R.
The volcano vaporizer is expensive, but that is to be expected for a vaporizer for a desktop. It was the second vaporizer that I have ever tried, and I will never go back to smoking my herb ever again. The vapor is super thick and way more powerful than I imagined, especially after having smoked for so long. Fast to vape - Review by Weeds P.
One of the things that I don't like about a lot of desktop vaporizers is the fact that they tend to make a lot of noise, but with the volcano vaporizer, I don't have to worry about that. It is quiet and it is efficient for use any time that I want to use it. It takes almost literally no time whatsoever for it to heat up entirely to the temperature that I need it at. Overall great! - Review by Irma M.
I love that the Volcano Vaporizer takes no time at all in order to heat up. This makes it an especially great party vape since we don't have to wait for a long time for it to heat up when everyone wants to use it. The only thing that I will say negatively about this desktop vaporizer is that the bags that come with it are kind of ok quality, but I can always buy more. Easy to clean and use - Review by Arthur J. The volcano vaporizer is super easy to clean and use, which helps me keep it running in its top capacity. The temperature control is totally precise which lets me play around with what temperatures I want to use depending on the herb potency that I currently have in it. Extremely efficient vaporizer - Review by Alberta P.
The Volcano Desktop Vaporizer is an extremely efficient vaporizer that doesn't waste all of my material in one session. This lets me pack in as much or as little as I want to at one time. It will vape the entire bowl easily no matter how much I have in it at one time without burning it. Exact temperature setting - Review by Stephen A. After trying out a number of other vapes of this caliber, I decided to try out the Volcano Vaporizer and I am so glad I did. It is the best vape for those who like potent, solid, clean clouds that are flavorful and robust. This thing really gets the job done. It gets up to temperature right away and is always at the perfect setting no matter what I hope to vape it at, thanks to the way that I can choose the exact temperature I want to run it at. I recommend it - Review by Miranda H.
The Volcano Classic is so impressive. I do not have anything bad to say about it. I loved this thing from the moment I took it out of its packaging and I wish I had gotten it sooner instead of wasting all that money on the old ones. I did not expect to love it this much. I had another one I was debating on getting but I am glad that I got this. It is really outstanding and I recommend it to everyone. High flavor and potency - Review by Tina M.
This is the best vape and the price is worth it. You won't find another desktop vape with such flavor and potency. Solid and sturdy - Review by Elizabeth G.
I love how solid and sturdy the Volcano Digit is. It performs just as well as it looks. The digital temperature control is outstanding and I love that I am able to choose the exact settings I want. It is worth every single penny and is super easy to use. It is not small though so it needs a designated place for it to live when not in use. Best of the best - Review by Terry D.
The Volcano Digit is a great investment and is definitely worth the money. Definitely consider it the best of the best. Best-ever desktop vaporizer - Review by Elaine L.
I used a few different desktop vapes before I got my hands on this one and I am just seriously impressed with what I found. It heats up after only a few minutes and takes no time at all to fill the bag. I love the mouthpiece and how easy it is for me to inhale. The vapor is so incredibly smooth it feels like I am hitting nothing until I exhale the vapor and almost immediately feel the effects. Overall, the Volcano Classic is the best-ever desktop vaporizer and I think everyone should own one. No worries - Review by Jennifer N.
The Volcano Classic is the end all for desktop vapes. I will never worry about getting another vape again because this is seriously the only one I need. Great desktop vape - Review by Carolyn W.
This was my first ever desktop vape and I thought about not buying it because of the price but I am so glad that I went ahead and did it. It is a brand new experience for me and I will never need another desktop vape. I love it - Review by Sau W.
I love my Volcano Digit. When I want to vape at home, this is the one I go for. It leaves all of my other vaporizers in the dust. Best desktop vaporizer - Review by Carol G.
This is by far the best desktop vaporizer I have ever used. The Volcano Digit is everything that people online say it is and I am so happy I bought it. Really happy with its performance - Review by Mandi B. If I only knew how much I would fall in love with the Volcano Digit I would have purchased it years ago instead of waiting. This is the best investment I have ever made. This is the most efficient desktop vape I think I have ever used. I am really happy with its performance. I am thinking about buying the Mighty next. Get it - Review by Aldo L.
I looked at getting this vape for years before getting it. My only complaint is with myself: I'm mad at myself for not getting it sooner! Does the job perfectly - Review by Peter C.
The Volcano Classic is something I have happily been using for years. I knew from the second I took it out of the box that it would become my new favorite piece. I own a pax which is great for on the go use but I wanted something else that I could use at home, and the Volcano Classic does the job perfectly. Saves material and money - Review by Cindy J.
I only got my Volcano Classic six months ago and it has already paid for itself. It saves so much more material and therefore money. Hands down best vape - Review by Minnie G.
This is hands down the best vape I have ever owned. I love how easy it is to use and how truly powerful it can be. Volcano vape is perfect - Review by Marion P.
The Volcano Digit is perfect. I tried a friend's first and then got my own. Bags fill fast and it is ready to vape in no time. Learning curve - Review by Johnny L.
I love how easy it is to use. There is a little bit of a learning curve at the beginning when it comes to learning how to make bags but after I figured it out I was hooked. Vapor is cool and smooth - Review by James B. All in all this thing is great. It only takes a little bit of time to heat and the vapor is cool and smooth every time. Would recommend it to everyone - Review by Clyde M.
I absolutely love my Volcano Digit. I got it because I needed a way to medicate myself without smoking since I have asthma. It is out of this world. It was a little tricky at first learning how to make new bags but once I figured it out, it is as easy as cake to use. I got the digital model because I wanted to be in control of the temperature more precisely than it allows me to do with the Classic. I love everything about the Volcano Digit and would recommend it to anyone. Well made - Review by Marcus K.
I love my new Volcano Digit. I finally decided to take the leap and got this vape. It is the best vaporizer that I could find and I will not be buying another any time soon. It feels really well made and I love that they upgraded to digital controls instead of the controls of the Volcano Classic. Give it a try - Review by Brenda J. The Volcano Classic is everything they say it is and more. I have been using it for around seven years and it just keeps going and going. It is very well made and I love it. The easy valve really makes a huge difference in the vaping experience so I recommend it. When the bag gets dirty, just throw it away and make a new one. There is limited maintenance that needs done on it which is great. Seriously, it is powerful and easy to use. No problems - Review by William C.
The Volcano Classic is worth every penny. I purchased it almost 15 years ago and it is still going strong. I use it every single day and I have never had any problems with it. I really enjoyed finding your website and getting great information on vaporizers. I then moved on to purchasing the Volcano from you. What an awesome vape! Your customer service was beyond anything I have ever experienced. You helped me find what I was looking for and I love my volcano! I have recommended you to my friends. I’ve been pondering on this one for a while now and finally decided to splurge on it. Best decision ever, and girls love it too, it’s perfect for parties! I have noticed that this feels better on my throat than smoking, glad I went for it! Everyone is nuts about Volcano and I finally caved in. The valves are leakproof so no worry here. I bought it because it’s a healthier option compared to other vaporizer and it’s great for parties as it lasts a lot. I also have the Classic one and decided to upgrade to the Volcano digit Vaporizer, keeping the other at my girlfriends house. I enjoy have better control over the temperature, and the automatic shutoff option will help me keep this vaporizer for years to come – it simply turns off if it’s not used for 30 minutes. The Volcano is the best quality I have ever run into! I have used vaporizers for many years due to asthma and have experience short-lived products. Constantly replacing one after another and being constantly frustrated. I purchased the Volcano from you a while back, and the service was unforgettable, as it was smooth and easy. Now and I am totally impressed with the quality, workmanship and performance by Storz & Bickel . I will never use any other vaporizer. Thank You! The bags last me around 4-5 months of decent use so you have to factor in extra expenses. You can tell this is a high-quality product, it’s very well built, sturdy and ok looking. I thought the analogue temperature dial will prove to be a huge con but you just have to experiment with it. I keep mine around 6 and get very strong vapors. First of all this vaporizer is absolutely fantastic, easy and convenient to use, quality build and design are top notch, now I know why many consider this to be the best or one of the best vaporizers available on the market. Second the guys at vapor plants are absolutely fantastic, they were extremely helpful and knowledgeable about their products and were also very patient while I was deciding on the right product. A+ for the volcano vaporizer and A+++ for vaporplants customer service. Thank you again guys!